While the squash is in the oven, prepare the stuffing. Cut the pears into small cubes. Add the chopped pear and all other ingredients into a bowl. Mix. After 20 minutes remove the squash from the oven and puncture it with a fork. Add the stuffing to the scooped out section of the squash. Return to the oven and bake for another 20 minutes. Check with a fork after 20 minutes. When the squash is soft it is done. If one side is larger than the other, it may have to cook for 5-10 minutes longer to get the right level of doneness. When it is done, let cool for a couple of minutes. Then scoop out all the ingredients into a bowl and mix. Add salt to taste. Garnish with sage pan fried in olive oil. The squash after 20 minutes is punctured with a fork. 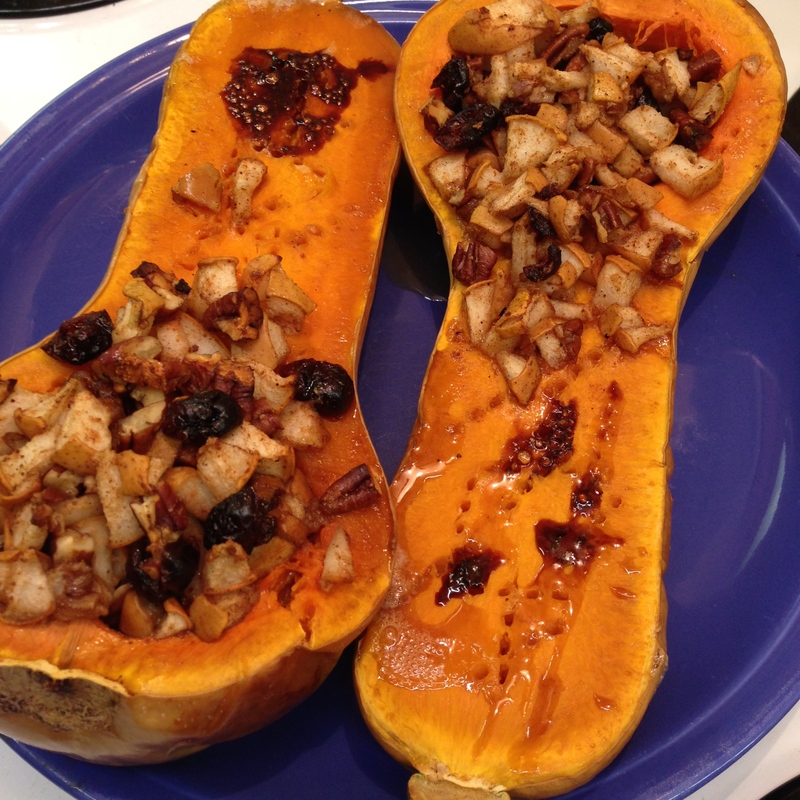 The stuffing can be prepared while the squash is precooking. A beautiful presentation right out of the oven. The finished product has been scooped into a bowl, mixed and garnished with fried sage. Fresh sage leaves from the garden make a delicious seasonal garnish when pan fried in olive oil until crispy.